The efficient prevention and minimisation of corrosion-induced deterioration in distillation columns is a key aspect helping refineries remain highly productive and competitive. One of the world's top integrated energy companies was experiencing corrosion issues on a number of units in its refinery complex in Spain. Sulzer’s automated weld overlay capabilities provided an economical and efficient solution to debottleneck the different columns and extend their service lives. The refinery complex is one of the five largest in Spain. The plant processes crude oil to obtain a broad range of chemicals, such as methyl methacrylate and polypropylene. When the refinery noticed extensive corrosion within the column shells of three main separation towers, it sought to investigate the issue and protect its plant from costly shutdowns or lengthy periods of suspended production. The initial inspection revealed that the column shells of the atmospheric distillation unit (ADU), the vacuum distillation unit (VDU) and a third fractionator were experiencing corrosion and erosion responsible for cracks, pitting and material losses. In particular, the column showing higher levels of corrosion was the VDU. The structure of the VDU consisted in one wash bed and three pump-around circuits for the recovery of HVGO (heavy vacuum gas oil), LVGO (light vacuum gas oil) and LLVGO (light light vacuum gas oil or very light vacuum gas oil). The tower had an internal diameter of 9.15 m and its shell was made of carbon steel coupled with a 3 mm bonded plate to prevent corrosion. Over time, the plate started to corrode and lost its ability to protect the underlying column shell. Based on the visible damage present on the bonded plate, the surface area of the damage was estimated around 65 m2. In order to repair and upgrade its columns, the refinery turned to Sulzer, whose Tower Field Service group has been supporting the company in the past with routine maintenance activities and field services. Sulzer’s team performed an in-depth visual inspection. To do so, the bonded plate was removed to expose the carbon steel shell. This examination revealed that the extent of column shell corrosion was almost double that of the initial estimate, covering approximately 110 m2. In these situations, refineries are often faced with the choice of replacing the entire column or part of it, which is costly and time consuming, or applying thermal-spray coatings that can prevent column corrosion only for a limited time. 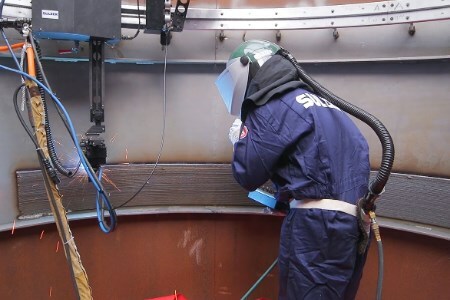 Sulzer offered a third, more time-efficient, economical and long-lasting option: weld overlay. By using this in situ process, it is possible to cover large column surfaces with corrosion-resistant alloys. The company is highly experienced in this technique and has developed a state-of-the-art, fully automated weld overlay equipment to support its operations. This machine consists of a carriage travelling along a laser-levelled track system fixed to the column shell wall. On the carriage, a robotic index arm moves the welding torch and the oscillator in order to create weld beads. All the relevant process parameters, such as carriage speed or bead thickness, are controlled by a programmable logic controller (PLC), with which human operators can communicate by means of human-machine interfaces (HMIs). One single PLC can monitor multiple welding machines following the same instructions. The automated process can quickly perform welding with high accuracy. As a result, customers can benefit from a high-quality and consistent process as well as short downtime. In this case, Sulzer could complete the overlay of the 110 m2 VDU corroded surface in the time allocated to 65 m2. In order to reduce the likelihood of future corrosion, the VDU column shell was overlaid with layers of austenitic stainless steel type 316 alloy, which is widely used in welding processes to avoid carbide precipitation. In addition, the presence of molybdenum and nickel makes the alloy suitable for applications in harsh conditions. In addition to repairing the VDU column shell, Sulzer also performed weld overlay on the corroded surfaces of the other two towers, namely the ADU and the third fractionator. Also, column internals, such as trays and packings, were replaced to further improve the performance of the entire oil distillation system. Sulzer performed the weld overlay process in two weeks, while the entire revamp was concluded in 25 days, without any delays despite of the discovery of larger corroded areas within the VDU, increasing the required weld overlay to almost double of the originally estimated area. Since the revamp, the refinery has operated smoothly at full capacity and the solution from Sulzer could also support the shift towards different crudes without affecting the columns’ corrosion resistance. The customer was so pleased with the work, that it offered to provide positive reference to any potential customers of Sulzer.